Bring on the sparkle with this easy to make crystal tennis style bracelet! No special beading skills are required and the materials list is a simple too. The body of the bracelet uses a row of single right angle weave (RAW) stitch in 4mm crystals with Japanese cylinder beads on the side for decorative accents and to reinforce the chain. But don't let any of that scare you from making one. It stitches up very quickly and is easy to follow a pattern. You can adjust the length of the bracelet by increasing or decreasing the number of units you make for the base of the bracelet. It can be difficult to add a new thread to this bracelet design. Consequently, it's best to use as long as the length of thread as you are comfortable working with. Cut a ten-foot piece of beading thread and thread a needle on one end. Pick up 4 bicones and push them down to the end of the thread, leaving a tail at least eight inches long. The tail is used to add half of the clasp later, so make sure you leave enough for the clasp you intend to use. Pass through the first two bicones to form a loop. The overall pattern of the bracelet will consist of a center row of the four crystal bead circles connected on the sides with the cylinder beads. You will make the center part of the bracelet first, then reinforce the edges with the cylinder beads. Continue the center of the bracelet by picking up 3 more bicone crystals. Pass through the bead that you were exiting at the beginning of this step. Pull the thread to make the crystals into a circle. Stitch through the next two crystals to position your thread to add another crystal unit. Continue adding three bead units in this same way. Pick up three beads, stitch back through the bead you were exiting, stitch through the next two beads to position your thread for the next set of beads. Stop adding the center units when your bracelet has reached the desired length. Be aware that when you add the Japanese cylinder beads in the next step, the length of the bracelet will shrink a bit. Always add two or three units more than you think you will need to ensure that the bracelet is long enough. Also, remember to take into account the size of your clasp. If you are using a larger clasp, you will need fewer units. If you are using a smaller clasp or a magnetic clasp, you will need to add additional units. After you have reached the desired length, pass through the next bicone in the bracelet so that you are in either the top or bottom bead of the base. Pick up one cylinder bead and stitch directly across into the next bicone. You will have to pull slightly on the thread so that there are no gaps between the bicone, the cylinder bead, and the next bicone. Repeat until you have added bicones between all the spaces across the top of the bracelet. When you reach the end of the bracelet base, pass ​the needle through the next two crystals. Remember to pull snugly to make sure that there are no gaps between the bicone, cylinder bead, and bicone. Pick up one cylinder bead and pass directly across into the next bicone. Repeat across the bottom of the bracelet. Make sure that your thread is coming out of one of the crystals on the end of the bracelet. To add the clasp, pick up three or four-cylinder beads, one half of the clasp, and another three or four-cylinder beads. Pass through the crystal again and then repeat the thread path to reinforce. If you are using a clasp with two rings, repeat this on the other side. Weave the thread end into the bracelet, and tie a few half-hitch knots. Weave into the bracelet a bit more, then trim thread close to the beadwork using embroidery scissors or a thread burner. Repeat for the other half of the clasp, using the tail thread. 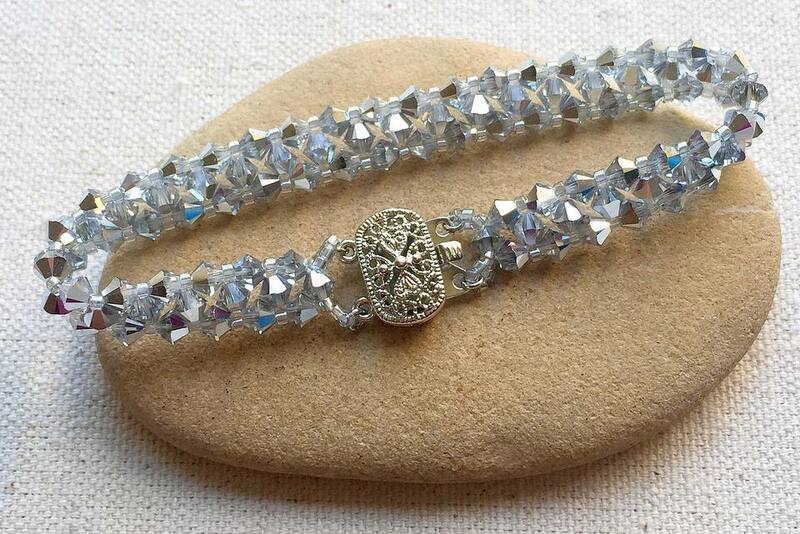 The finished easy Swarovski crystal bicone tennis bracelet. This bracelet is very flashy, but you can tone it down a little using a darker colored crystal or even black.